Fees associated with filing industrial design applications in India as well as other design fees are available in the fee calculator. An Indian industrial design application should contain one single design and refer to one class only. 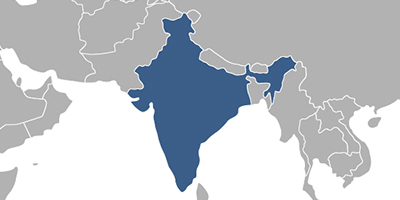 The official languages of an Indian design application is English or Hindi. If the Priority Document is not submitted at the time of filing of the application, it can be submitted with an extension of 1-3 months with the payment of the official fee. If the priority document is not in English, a certified English translation thereof is also required to be filed along with the priority document. The term for filing a design application claiming conventional priority in India is six months from the priority date. This term is non-extendable. The legalisation or notarization of the Power of Attorney is not required. It is recommended to provide the Power of Attorney simultaneously with the filing of the industrial design application in India. A design application filed in the Indian Patent Office undergoes both formal and substantive examination. No special request needs to be filed as the examination is carried out automatically. - exhibition or publication of the design or of the description of the design by any person elsewhere without the consent of the proprietor during or after the exhibition. Upon granting, the design patent is valid for 10 years from the registration date. This term may be extended for five years if the corresponding request is provided and the corresponding fee is paid before the expiration of the 10-year term. A grace period of twelve months from the date of registration expiration and a surcharge applies when the renewal fee wasn’t duly paid. Registration of a design application takes an average of 7 months dependent on whether the design process is smooth. For foreign applicants, it is recommended to perform design prosecution in India through an agent, a registered Indian patent attorney. Online database for Indian Industrial Designs, DesignView.